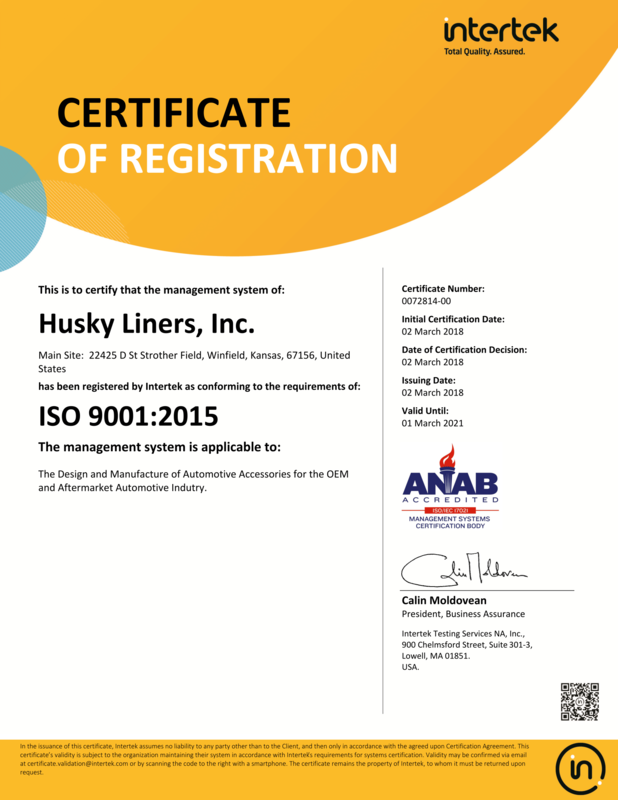 Husky Liners® will warrant any part during the warranty period that proves defective in material and/or workmanship under normal installation, use, service, or maintenance. Customer will be responsible for returning alleged defective product to the manufacturer. Manufacturer will be responsible for shipping of replacement product to the customer once returned parts are received. Please have a copy of your purchase receipt available when you call. The foregoing is the only express warranty made by the manufacturer and is limited to the duration of this warranty. ANY IMPLIED WARRANTY OF MERCHANTABILITY OR FITNESS FOR A PARTICULAR PURPOSE IS LIMITED IN DURATION TO THE DURATION OF THIS WARRANTY. LABOR CHARGES, INJURIES, OR ANY OTHER LOSS OR DAMAGES WHATSOEVER, INCLUDING THOSE INCURRED IN INSTALLATION ARE EXCLUDED. ADDITIONALLY, PAINTING OF REPLACEMENT HUSKY LINER® PARTS AND ANY VEHICLE COMPONENT REPAIR OR REPLACEMENT AS WELL AS INCIDENTAL DAMAGES ARE EXCLUDED.